Oxford, September 4, 2018 – Used to produce three-dimensional objects of almost any type, across a range of industries, including healthcare, aviation and engineering, 3D printed materials have come of age during the last decade. 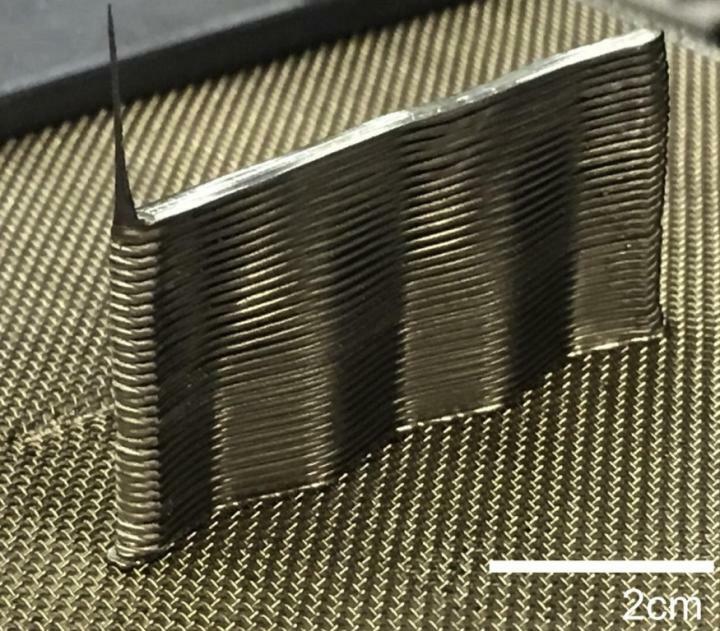 Research published in the journal Materials Today demonstrates a new approach to 3D printing to fuse metallic filaments made from metallic glass into metallic objects. Unlike conventional metals, bulk metallic glasses (BMGs) have a super-cooled liquid region in their thermodynamic profile and are able to undergo continuous softening upon heating–a phenomenon that is present in thermoplastics, but not conventional metals. Prof. Schroers and colleagues have thus shown that BMGs can be used in 3D printing to generate solid, high-strength metal components under ambient conditions of the kind used in thermoplastic 3D printing. Copies of this paper are also available to credentialed journalists upon request; please contact Jonathan Davis at [email protected]">[email protected] or +31 20 485 2719.